When Texas Children’s Hospital first opened its Pavilion for Women in March 2012, there was support and commitment from leadership to eliminate preventable, adverse events. Seeing opportunity to target episiotomy rates during childbirth, the hospital embarked on a mission to safeguard the health of mothers and babies in their care. “Early on, we reviewed a lot of information – National Quality Forum measures as well as Leapfrog standards – and we tried to figure out what made sense to measure. We created a taskforce with the goal of assisting clinicians to meet The Leapfrog Group’s target rate for episiotomies,” explained Frances Kelly, Director of Quality and Safety at the hospital’s Pavilion for Women. In its 2018 Maternity Care Report, analyzed by Castlight Health, Leapfrog found that the average rate of episiotomies across all reporting hospitals declined from 9.6 percent in 2016 to 7.8 percent in 2017, the lowest rate since Leapfrog began collecting data and publicly reporting on this metric. Nonetheless, the use of these potentially dangerous incisions remains well above Leapfrog’s standard. The report also showed wide variation in episiotomy rates in hospitals across the country. The process to address and lower the episiotomy rate at Texas Children’s Pavilion for Women was divided into five phases. The first phase was the pre-intervention stage, which tracked data and provided a benchmark. Phase two involved educating clinicians about the need to perform episiotomies less often, as well as collecting data about the existing episiotomy rates in the hospital. The task force found that Texas Children’s Hospital physicians already met the Leapfrog goal of 12 percent or less, with episiotomies performed in 9 percent of births at the time. During the third phase, the hospital adopted Leapfrog’s updated rate of 5 percent or less. In phase four, hospital leadership continued to track the episiotomy rate for the hospital as a whole, but also dug deeper to look at individual episiotomy rates for providers. In the current phase, providers receive their individual episiotomy rates in comparison to peers and these rates are published quarterly. Texas Children’s Hospital had maintained guidelines about restricting episiotomies for a number of years before the formation of its task force, but it was the introduction of progressively lower targets and the availability of comparative data that caused clinicians to fully apply the recommendations. Ultimately, the “Hawthorne effect” – when people improve their performance because they know they are being monitored and compared with others – played a major role in this transformation. When doctors began seeing their own data and how it compared with hospital averages, they achieved their most significant reductions, demonstrating the importance of transparency and availability of information. “I think the reduction in episiotomy rate shows the importance of providing the structure and tools necessary for people to understand and improve upon their performance,” said Kelly. The final result was a decline from use of episiotomies in 9.11 percent of births at Texas Children’s Hospital to today’s rate of 3.44 percent. The current episiotomy rate is 62.2 percent lower than when data was first collected. Kelly credits the rapid improvement found at Texas Children’s Hospital to leadership engagement, distinct and transparent goals, intensive monitoring, constant feedback, and transparency internally and externally. 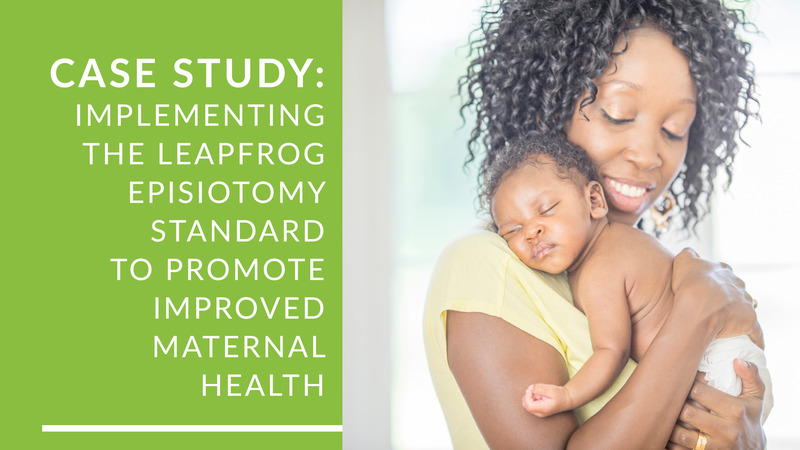 The Leapfrog Hospital Survey and its clear performance standards and benchmarking was a key lever in that success, protecting the health and lives of their patients. “Transparency is a central component to our quality and safety program here at Texas Children’s,” said Dr. Steven Clark, professor of maternal-fetal medicine at Baylor College of Medicine and director of the Texas Children's Health Pavilion for Women Fellowship.